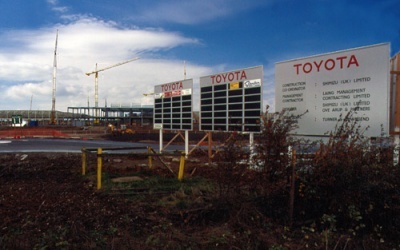 Toyota has become one of the largest global car manufacturers and in the early nineties the Burnaston Derbyshire Plant was built to produce Toyota cars for Europe. The M&E services were designed by Arup and installed by Drake & Scull Engineering (Now part of the American Emcor Group). Again Eddy Warren spent a lot of time with Arup in London assessing the scheme for expansion and similarly on site with D&S. Because of the nature of the structure and all the services on elevated pipe tracks Arup's structural engineers had calculated differential wind load movements of the pipe track to buildings. All services at building entries had to have Stainless Steel Articulated bellows to accommodate the movement. Again the steam mains posed big expansion problems. Crossing the energy centre in 600mm (24") from the 700mm (28") steam header the steam split in two directions on the pipe track each at 400mm (16"). Two 600mm Gimbal Stainless steel bellows accomodated the movement in the energy centre and on the 400mm on the pipe track each contained 3 Stainless steel hinged bellows in "3 pin systems". All the Expansion Bellow guides and supports ran on RPTFE for low friction. A coordination drawing for this part on the three pin system was produced for D&S in their site office by Eddy Warren.